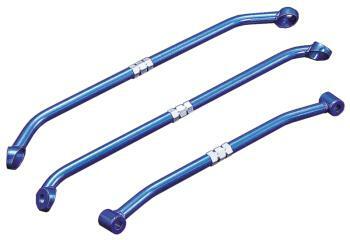 The Cusco Tension/Radius Rod is an adjustable steel bar and is installed on the front lower suspension. The bar stabilizes alignment and enhances rigidity on the tension rod mounting brackets. It is 22mm in diameter and is painted the classic Cusco blue. The tension on this rod can be adjusted through the turnbuckle, which will allow for more rigidity in the lower suspension mounts. It comes with all the required hardware for installation and bolts on in minutes using normal hand tools.